In medium bowl, toss strawberries and 1/2 cup sugar until coated. Let stand 1 hour. Heat oven to 375°F. Spray baking sheet with cooking spray. 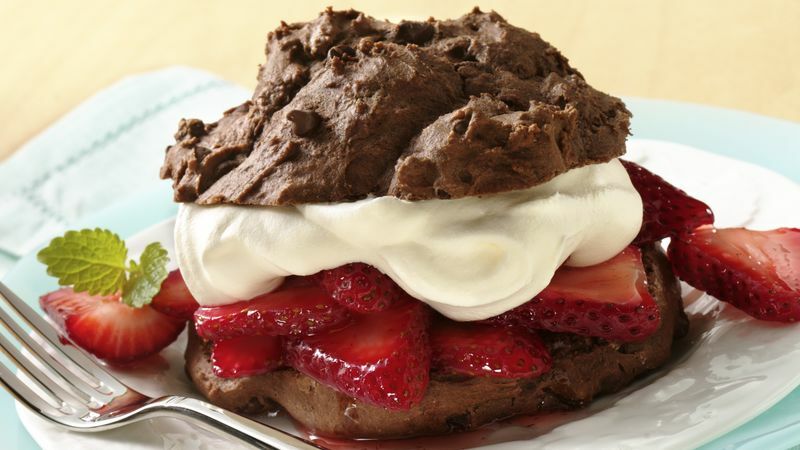 In medium bowl, stir Bisquick™ mix, cocoa, 2 tablespoons sugar, the milk and butter until soft dough forms. Stir in chocolate chips. Drop dough by about 1/3 cupfuls onto baking sheet. Bake 12 to 15 minutes or until tops of shortcakes appear dry and cracked. Cool 15 minutes. Using serrated knife, split warm shortcakes. Fill and top with strawberries and whipped topping. Special Touch Sprinkle additional mini chocolate chips over tops of shortcakes.